A nice fresh roasted peanut taste, a medium-thick consistency and a touch of salt. A little bland in my opinion and not quite up to par with Whole Foods 365 Crunchy but a good solid peanut butter. Use as you would normal peanut butter. Cinnamon currant is my favorite flavor of peanut butter so I was excited to try this one. The texture is very creamy and the currants are chopped up so it spreads easily. The flavor is a little bland yet the sweetness is too high and the cinnamon is barely noticeable. I prefer homemade cinnamon currant peanut butter. Perfect for a peanut butter parfait to add some sweetness to plain yogurt. This flavor most reminds me of America’s Choice peanut butter. America’s Choice is a store brand sold in some markets on the east coast, it’s non-natural but contains only a tiny bit of fully hydrogenated oil which is trans-fat free. 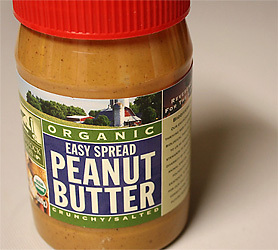 When you stir it really well in the jar it becomes perfectly creamy and is one of my favorite peanut butters. “Dreamy Creamy” is very similar in consistency right out of the jar but a little bit sweeter. The texture is excellent but I prefer peanut butter with a touch of salt instead of sugar. This flavor is great on a traditional pb&j, and a reduced sugar preserves will work just fine. Very similar in consistency to the “Dreamy Creamy” but with lots of small peanut chunks and not quite as sweet. I prefer this flavor to Dreamy Creamy because of the crunch and lower sweetness. This flavor is perfect for a peanut butter and banana sandwich. I still have a full-sized jar of this flavor that I reviewed earlier. Tthis flavor is sweet, but that is expected. The chocolate flavor is pronounced immediately while the banana flavor comes through at the end in little banana-flavored crystals spread throughout the mix. A great flavor but it’s uses are limited. The flavor is too distinct and lost when used on a sandwich or with fruit. I recommend spreading this on banana pancakes with just a touch of maple syrup. Very similar to the CocoBanana except the banana flavor comes through right away in this variety. Since there aren’t too many flavor combinations in works here, this flavor works great in ice cream / smoothies to bring out a strong banana flavor. Of course it still works great on top of some pancakes. This creamy peanut butter contains tiny dark chocolate chips. I like the presentation but there is something much more enticing about Peanut Butter & Co’s version where the peanut butter and chocolate is mixed and boasts a rich, black color. However, I prefer this version because it is less sweet. Perfect on toast. Who doesn’t love the taste of raw cookie dough? This peanut butter does a wonderful job of recreating that flavor. The only problem is that the taste of peanut butter is almost completely absent. There is an overwhelming sweetness that can only be described as cookie-level sweetness. A great peanut butter on it’s own in small quantities and perhaps good for cookies but that might defeat the purpose of that raw flavor. I used to love white chocolate. That was before I switched to dark chocolate. Nowadays white chocolate is too sweet for me and this peanut butter follows suit. The raspberry taste is much better than Sunland’s raspberry flavor and the combination here is unique but I can’t think of many uses for it. Best enjoyed solo in nibbles. This is the most interesting peanut butter of the lot. This peanut butter is bright yellow and has the perfect amount of curry flavor. It’s great as a standalone dipping sauce for chicken sate or as a base for homemade peanut sauce. I love how unique this flavor is, and while I wouldn’t eat it on its own, it is the perfect bread spread (mayo replacement) for a roasted turkey, lettuce, onion and tomato sandwich. Again, cinnamon currant/raisin is my favorite peanut butter flavor. This one falls between Peanut Better’s and my homemade version. It’s less sweet than Peanut Better and has more cinnamon flavor. For the best cinnamon raisin peanut butter make your own, it’s cheap and lets you control the sugar/cinnamon levels. 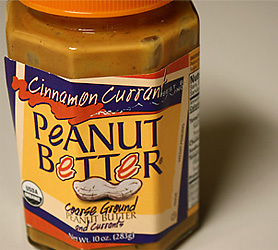 But if you must buy it then I recommend Peanut Butter & Co’s cinnamon raisin peanut butter over both P.B. Loco and Peanut Better’s versions. Again, great in a peanut butter parfait. The booklet that comes with the chocolate pack has a small description for each bar and does a very good job and pinpointing the flavor and texture. 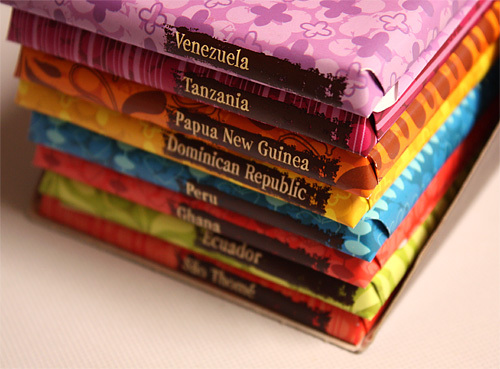 It also suggests a unique beverage pairing for each bar, ranging from unsweetened cappuccino to Cabernet Sauvignon. I highly recommend you stop by your local Trader Joe’s store and pick up this pack for $9.99. These photos were taken with my new Canon Rebel XSi camera. I can see a marked improvement over some of my previous photos. However, I have only used the automatic settings as I am awaiting my new companion book to guide me through the camera and DSLR photography in general. The pictures should improve dramatically from here. Stay tuned! I love food gifts. 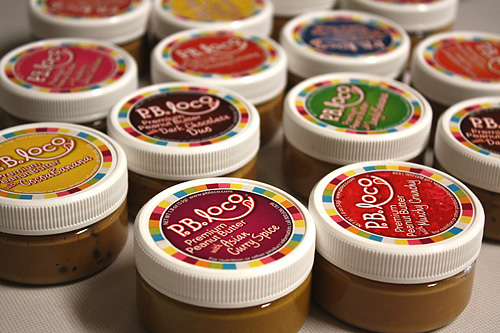 Haven’t had PB in different flavours…sounds really interesting! Looks wonderful. I am jealous. What unlikely pairing with the peanut butter have you tried and thought wow, that is not bad at all? I just love consumer reporting blogs. I am gonna definitely look into the Trader Joe chocolate pack. I did not even know there was such a thing as a peanut butter of the month club. Awesome! I am green with envy. The PB Loco Dark Chocolate Duo sounds amazing, and I’d love to try the PB Loco Asian Curry Spice on some chicken. You scored big time…your friends and family know you well! Lucky you! What a fabulous chocolate and PB haul! I’m running out of peanut butter. Eek! Need to re-stock. Mmmmm.. the asian curry pb sounds yummy. Thanks for reviewing all these peanut butters! Hope all is well, Nick! I saw that cute gift pack of P.B. Loco’s and first thought of me, then thought of you! I didn’t get them. Lucky! YUM to all the chocolate, too! Holy Peanut Butter, Batman!! I wish I could dip my spoon into each one and try them all. Your so lucky! You must be one happy man right about now. PB Loco is so colorful too! Congrats on your choice of camera. I bought the same camera in July. I’m still experimenting and am curious about the book you mentioned. Could you send me the information on that. I could use some type of tutorial, since I am definitely am amateur and need guidance. And, you lucky dog you……with all of that peanut butter and chocolate. I love a lot of the chocolate that Trader Joes’ offers. You can’t beat the value. Oh you lucky peanut butter Boy! Great news! PB Loco’s gift packs are great! I gave myself one for Christmas, in fact. I do agree with you on the cookie dough – the flavor is AMAZING (“too sweet” isn’t usually a problem I have) but I can’t think of any appropriate way to use it other than to eat it straight. Not that there’s anything wrong with that… I haven’t cracked open my Asian curry spice yet, but it sounds like I need to. The new camera looks like it works great! You must be in heaven! I am so jealous of all of those PB flavors. I’m almost out of my Naturally Nutty and must restock soon. Oh and the pictures look great, and so professional. THE best peanut butter in the world is made by Parkers Farms. You buy it in the refrigerated section and it’s a no-stir all natural type. Their chunky PB has WHOLE peanuts in it (along with halves and bits). I really like the honey roasted too. It’s dangerous stuff! Parker’s Farm Peanut Butter is made in Minnesota… you can buy it at Cub Foods locally and at Walmart Superstores… I agree – it is THE BEST! Walmart Superstores? I’ll check the nearby one, thanks! What awesome gifts! And those mini jars of the PB Loco peanut butter are too cute. WOW, I’m jealous. Enjoy your gifts, Nick! That pb better be put to good use! Seems like someone is swimming in PBs and chocolate! Lucky you! Have fun with all of them. holey cow! that’s a lot of PB and chocolate!! i’m a little jealous… esp of that cinnamon pb! I had no clue there were so many flavors. The cinnamon one sounds mighty fine. Nice haul! Thanks Nick! I’ll be sure to email Katie, as I can’t wait when it comes to PB. “neverlasting gifts” — I like that. And mobilizing peanut butter is always an issue. I get funny looks going into work with a 55-gallon drum on a dolly. The little jars would be awesome. You should have a giveaway: one lucky person gets one empty jar. Then have another giveaway for the lid. I love the variety pack of peanut butter!! PB Loco is new to me–but looks like my newest best friend! Sounds like a lovely Christmas! This is so fantastic it’s almost making my head spin! I took a PB (no J!) sandwich to school every single day for almost 5 years when I was little, so it’s safe to say that I love peanut butter! Anyway, I’ve been lusting after that PB Loco stuff on their website for ages, and only recently discovered a few varieties of it in a small grocery store. You’ve definitely inspired me to get my jars out and start sampling! PS I’m glad to have found your blog! Parkers Farm seller locations link here. I have found it at Whole Foods, too. I love P.B., I will be running straight for my local Trader Joe’s to see if I can find this. Uh, Nick? Ya hi. I’m drooling over here. Hey, I found you from my brothers site: http://www.backtothefridge.com. I am glad I am not the only one who gets weepy watching the video of Paul Potts on Britain’s got talent! Can’t wait to check out your site – but I don’t think its possible for anyone to love peanut butter more than my brother Charlie!! I appreciate you doing the leg work for me. I do prefer just plain pb but maybe I will get adventuresome with some of your suggestions. Probably try your recipe for cinnamon currant. Clearly there is an entire world of peanut butter out there that I have yet to discover. Some great gifts there. HOLY COW! you werent lying! Well if you ever need to get rid of some there is a lovely blogger in NY willing to take them off your hands. LoL! Is PBLoco back in business????? I love it but the website shut down within the past year! Hey Amanda, Unfortunately I think they are completely gone! They had some really unique flavors, it’s too bad to see them go! I’ll have to make up for it by creating all their flavors at home and sharing them! This post was from Christmas 2009 when they were still around.